Maria Sanchez, a 29-year-old Modesto product, won her fourth WTA doubles title and second in a row on Sunday. The third-seeded team of Asia Muhammad of Las Vegas and Sanchez beat unseeded Australians Monique Adamczak and Jessica Moore 7-6 (2), 6-4 to win the Abierto GNP Seguros in Monterrey, Mexico. Muhammad, 28, and Sanchez did not lose a set in their four matches. Sanchez, who also won a $115,000 tournament in Guadalajara, Mexico, with Fanny Stollar of Hungary last month, rose 16 places to a career-high No. 53 in doubles. When Sanchez was 10, she lived in Guadalajara for a year with her family. ITF World Tennis Tour -- Fifth-seeded Barbora Krejcikova of the Czech Republic crushed top-seeded former Stanford star Nicole Gibbs 6-0, 6-1 in the final of the $80,000 Innisbrook Open on clay in Palm Harbor, Fla. Gibbs, 26, improved 11 spots to No. 113. USTA International Spring Championships -- Top-seeded Hurricane Tyra Black, 18, of Boca Raton, Fla., outlasted Connie Ma, a 15-year-old wild card from Dublin in the San Francisco Bay Area, 6-2, 4-6, 6-3 for the girls 18 title in Carson, Calif. The Bryan brothers and Vivian Ovrootsky won big titles on Saturday. Third seeds and ex-Stanford stars Bob and Mike Bryan beat unseeded Wesley Koolhof of the Netherlands and Stefanos Tsitsipas of Greece 7-5, 7-6 (6) for their sixth Miami Open crown and second in a row. The 40-year-old Bryan twins saved four set points in the second-set tiebreaker. They also survived four match points in their 7-6 (7), 6-7 (8) [14-12] semifinal victory over top-seeded Lukasz Kubot of Poland and Marcelo Melo of Brazil. The Bryans collected their 118th tour-level title and second since Bob returned to action in January after missing eight months. He underwent hip replacement surgery last August. "A doctor was cutting me open eight months ago, and I wasn't sure if I was going to be able to make it back on court," said Bob, who lives in the Miami suburb of Sunny Isles Beach. "To win this title is a dream and certainly wasn't possible eight months ago. This huge for us." Ovrootsky, a 14-year-old San Jose resident, downed DJ Bennett of Belleview, Fla., 6-3, 6-4 for the Easter Bowl girls 16 title in Indian Wells. Ovrootsky was seeded ninth and Bennett 10th. "I didn't play my best tennis today, and DJ played unbelievable tennis today, and her forehand was really on," Ovrootsky, who also received the USTA Sportsmanship Award in her age group, told publicist Steve Pratt. "I just had to get through the match and stay offensive." 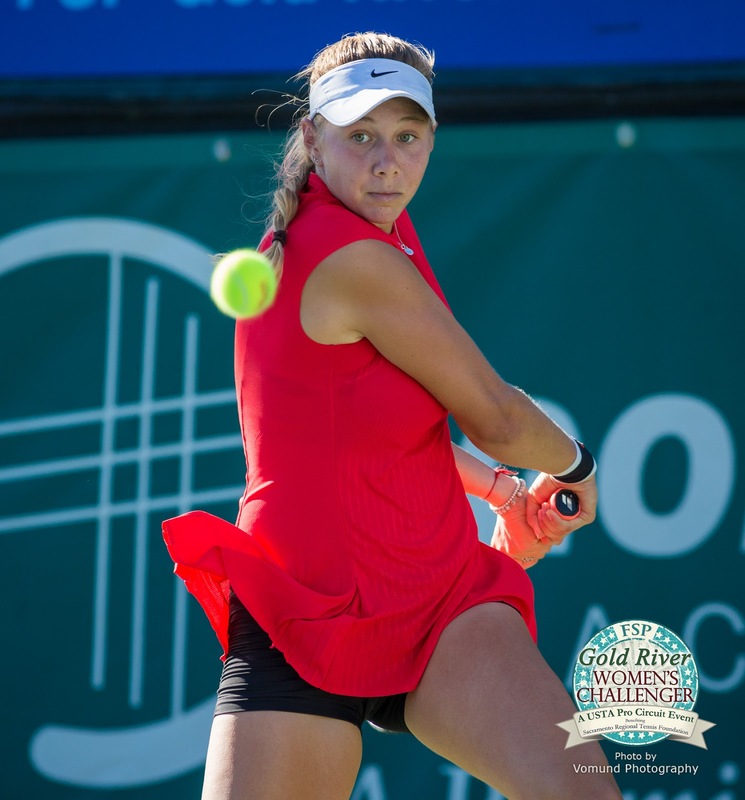 Ovrootsky, who won an ITF Level 4 tournament in Irvine last week, extended her winning streak to 12 matches. "It was tiring, but I think I recovered well, which is why I was able to move the way I did today," said Ovrootsky, who has won three USTA gold balls and two silver balls. Ovrootsky takes online classes and trains under Nick Fustar at the Eagle Fustar Tennis Academy. Two other San Francisco Bay Area residents, Ria Bhakta of Saratoga and Natasha Rajaram of Los Altos, lost in finals on Thursday. Third-seeded Tsehay Driscoll of Pacific Palisades in the Los Angeles area topped the second-seeded Bhakta 3-6, 6-1, 6-1 for the girls 14 singles title. Unseeded Daniela Borruel of Buena Park in the L.A. region, and Rebecca Kong of San Diego dominated second-seeded Thea Latak, from the Chicago suburb of Burr Ridge, Ill., and Rajaram 6-3, 6-1 for the girls 12 doubles crown. NorCal Hall of Fame -- The USTA Northern California Tennis Hall of Fame will enshrine prominent coach Brad Stine and four others at a luncheon on Friday, June 21, at the Peninsula Golf & Country Club in San Mateo. The event is scheduled for 11 a.m. to 2 p.m.
--Elly Hakami, who reached No. 32 in the world in singles in 1988 and No. 68 in doubles in 1987. --Jeff Greenwald, a sports psychologist, author and top 40-and-over player. --Administrators Linda Peltz and Mike Skinner. Developmental Coach of Year -- Joseph Gilbert, the owner and director of the JMG Tennis Academy at Arden Hills Athletic & Social Club in Sacramento, became the first two-time winner of the Team USA Developmental Coach of the Year award. --Collin Altamirano and Jenson Brooksby, the 2013 and 2018 USTA boys 18 national champions, respectively. --Ishaan Ravichander and Mason Nguyen, the boys 18 and 12 winners, respectively, in the USTA National Winter Championships in January. --Zachery Lim, who won the boys 16 title in the International Spring Championships in Carson last April. Colleges -- Caroline Lampl edged Rianna Valdes 3-6, 6-3, 7-6 (4) to give the No. 7 Stanford women (14-1, 5-0 Pac-12) a 4-3 victory over No. 16 USC (13-3, 3-1) in Los Angeles. Emily Arbuthnott, one of the Cardinal's top players, missed the match for an undisclosed reason. No. 11 UCLA (12-4, 4-1) routed No. 15 Cal (9-5, 3-2) 6-1 in Los Angeles. The No. 12 USC men (13-6, 3-0) outplayed No. 10 and host Stanford (12-4, 2-2) 4-1. No. 19 UCLA (10-4, 3-0) beat No. 40 Cal (9-9, 2-2) 4-2 in Berkeley.